“Going, going, gone!” Seventy-five dollars. The camel back trunk was mine! “So how are you going to get that back to Oregon?” June asked. “Well, there is that,” I thought. Trunks. Oh, how I love trunks. “Mom, you don’t need another trunk,” my son explained as I contemplated another. In a small place trunks became storage areas. The trunk in the living room holds 60+ years of photographs. Upstairs in the spare room the camel back, which did find its way west, holds old memories, items from the past. The trunk in my bedroom holds linens. A trunk that was given to me now resides at my son’s home. The old steamer trunk was given away last year due to space. I love trunks. I contribute this ‘trunk’ obsession to my maternal grandmother. I don’t remember much of Mom Johnson. I was young when she died, and she was not a warm, cuddly person. However, I do have a memory of sleeping over in their spare bedroom. In that room was an old trunk. My grandma wanted to show me what was inside. She took out cast iron back in the shape of a dog. 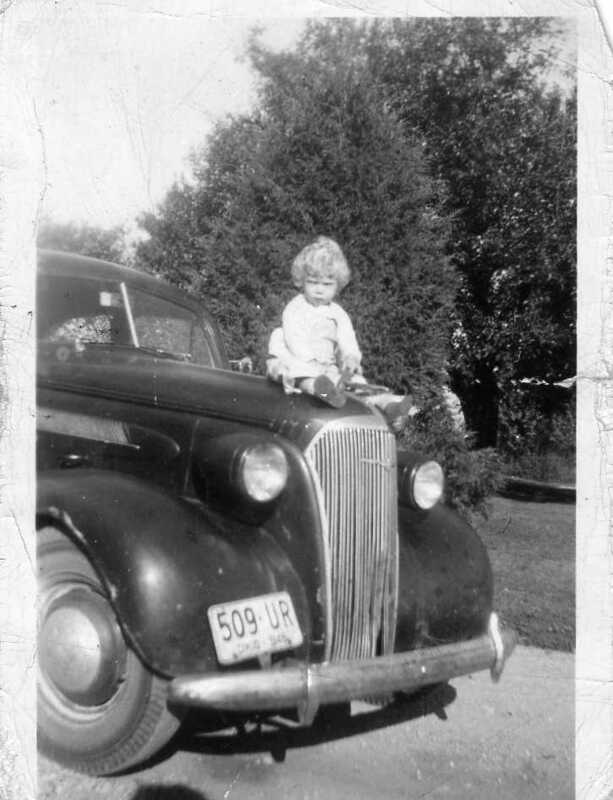 “This was your Uncle Bob’s when he was a little boy,” she explained then continued through the trunk showing me books and other items that had belonged to her children, her family. Perhaps this one single event showing me a woman that I otherwise don’t remember tied me to this love of old trunks and the treasures they hold. These old trunks traveled many miles and carried clothing, dowries, trinkets and more for these settlers who peopled our land. In the resale shop I found an old, handmade tool box. It now stands in the corner of my living room holding books. Last year I found a little red tool box at an estate sale. It now holds my mother’s old diaries and sheet music. My sister and I walked around the flea market at Shipshewana, the place I found my old camelback trunk. “June, look at the tool box!” A cute tool box was calling my name once more. Who would have guessed that my mother had ever worked away from the farm? Like many of the community, Mom, too, worked at the tomato canary when the tomatoes were ripe, picked and ready to be packed for market. Money was always tight. A bit of extra cash was needed. My sisters knew this information, but it was new to me. “I remember sitting with Mom in Leah's kitchen counting potatoes,” Peg said. Many people in our area grew potatoes. For many farmers, neighbors were part of the digging crew once that time of the year rolled around. Adults and older children would dig the potatoes as some of the wives and mothers counted. Younger children played with other kids who tagged along. Peg explained how numbered tags were handed to each potato digger then placed on the bushel basket they carried to the field. After the baskets were filled with freshly dug potatoes, they were loaded onto a wagon that carried them to the counters. Mom sat in the kitchen with other women counting the number of potatoes in each basket. The count was then written on the tag, the pay slip used in paying the worker at end of the day. The payoff on a bushel was 4-6 cents. Money was scarce. Farmers and their women worked hard for every penny they earned. While the women worked, little ones stayed with an older sibling, another relative or sat at the mother’s feet or in a makeshift crib while the mother earned her daily wages. It was a way of life. I didn’t know that Mom worked away from home. I didn’t know that Mom contributed financially to the household. We girls always thought that Mom would have liked to go to college. She was an intelligent woman with a desire to learn. Of course, her father would never have considered sending a girl for higher education. ‘A woman’s place was in the home’. I wonder what she would have done had she had choices to make. What contributions could she have made to a society that had a narrow view of women? What could she have done to reach her potential? 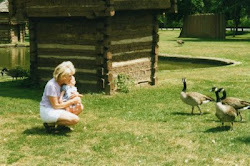 Mom always wanted to do more; however, she did much in the only arena in which she could participate. She loved doing for others, teaching songs to youth, organizing a group of teens or bunch of women for projects. Mom was a doer. Her life was rich in experience. Mom yearned to learn as much as she could expanding her knowledge and her beliefs. She continued to learn until she could learn no more. Funny what you learn when you spend some time with your siblings. What happened to Dad’s herd of cattle? Why did Grandad have a glass eye? When did Brenda move next door? The questions continued and memories were stirred once more. June is 7 years older than me. Peg is 10. We share the same past but see it from different ages and understanding. I always kick myself for not asking more questions after I return home from a visit. This time I tried to make a conscious effort to ask different questions. Dad’s herd of cattle was contaminated with Bangs disease. Bangs disease is known as Brucellosis of cattle or “contagious abortion. 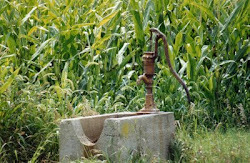 The disease can also be passed onto humans causing undulant fever. There is now a vaccine for calves preventing the fever. When it hit Dad’s herd, the cattle had to be destroyed. What happened then changed the course of our family forever. No one knows why Grandad had a glass eye. My sister was so curious that she asked our aunt, his daughter. She didn’t know either. He had a glass eye as long as anyone could remember. Hm. 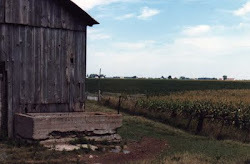 Unbeknownst to me I had lived elsewhere before Mom and Dad moved to our farm. We lived on the other side of the ‘block’ closer to my grandparents. My best friend, Brenda, and her family lived on that side as well. 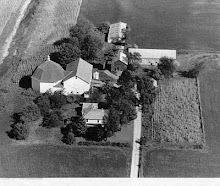 We all moved to Neff Road when our fathers bought their farms. I love this quest for new knowledge of our family. 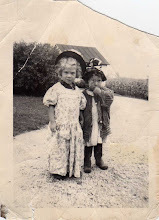 The memories of a glass eye on the windowsill, a black derby hanging on a hat rack, a milk stable vacant, the new cure for my sister’s rheumatic fever, the list goes on. This history builds and sisters become closer. The years separating us as we grew up disappear. Our history. We share it, you and I. Your stories have pieces of my own. My stories awaken memories of your own. We only have a limited time to gather. The discoveries might not be earth shaking, but they just might open new doors of discovery and conversation with those who have traveled that journey with you. My sister, June, and I love antiquing. I consider us modern day adventurers in search of antiquity. We search for those reminders of our childhoods and those things we have come to love over the years. This trip allowed us to travel twice to Shipshewana for the flea market held every Wednesday. The auction barn is filled from front to back with various stations for different vendors. June and I walk the barn looking for treasures. We go early enough to find items we are interested in bidding on. She looks for leaded windows she can repair and resell. I look for anything that I might discover that calls to my heart. We are in paradise. At 9am the auctioneers begin their calls. Not just one auctioneer, but at least three. The chaos begins as the callers seem to compete with one another as their unique calls echoes through the barn. People crowd around the tables as old items, once cared for, move on to new owners. A couple of mounted deer heads are waiting to be auctioned. I pat their heads giving them one last prayer thinking that they would have been much happier roaming a forest. Guns and knives are sold. Pots and pans, books, old toys and so many other things that my parents probably threw out go home with new owners to be resold or as with me, just cherished. I stood next to an Amish woman waiting for her item to come to the auctioneer’s attention. We laughed and talked as we waited and watched the crowd around the tables. Soon the oil lamp came to the block. This woman was not waiting for a collectible or something that tickled her fancy. No, she was bidding on a staple for her home. She walked away with her lamp and I walked away with my Haitian prints. It was a good day. June and I went to the Amish restaurant, Yoder' for breakfast each of us devouring three huge pieces of old fashioned mush. 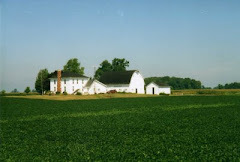 The Amish women served the tables wearing their white caps and simple dresses. More and more of this community are going back to the simpler life. I came home with a few treasures. Two old paintings from Haiti circa 1930’s or 40’s and a few old books. I didn’t come home with the teddy bear, dolls or tea jar. However, two sisters had the time of their lives doing what they love to do together. On the way home, we passed a man plowing his field in the same way my father had once farmed. What a beautiful sight! 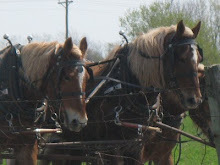 Four Belgian horses pulling the plow. 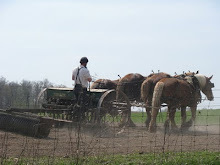 “You know the Amish do not like their pictures taken,” my sister was saying as I hung my camera out the car window. “I’m taking pictures of the horses,” I said as the Amish farmer returned my wave. I had stepped back in time. I had stepped back to a simpler life. Once more two sisters made memories. Packed the bags, packed on the miles and packed on the pounds. Now for the unpacking. Argh! There is nothing better than comfort food. I find most food comforting. I love traveling and trying the fare of each location. In Key West, we dined under the trees on seafood and pasta. One of our favorite places was Babaloos. Each time I visit my sister, we head across the Keys for one reason and one reason only: Chicken livers. Growing up on the farm, nothing on the chicken was wasted. The giblets were family delights. Chicken livers were the ultimate prize. June knew I would love Babaloos because it reminded her of Huston’s in Arcanum. A menu board boasted the daily fare as well as the numerous side dishes, a choice of two, from mashed potatoes to cottage cheese. Ah, yes, a reminder of home. On our trip up from Key West to Virginia, we passed through grit’s country. Grits were something I discovered in earlier years traveling south. Love at first bite. However, nothing rivaled the breakfast side dish of good, ‘ol country mush. For some reason Bob Evans restaurants haven’t quite made it to Oregon….along with the mush. So mush was on my plate as often as I could find it. The best mush was found in Shipshewana, Indiana, where the Amish served it in true country fashion. Comfort foods are aptly named. They are reminders of a simpler time, of farm hands working the fields, of Mom cooking over the old kettle and cast iron skillet. Oddly, I don’t bring home these dishes. Polenta could take the place of mush but isn’t quite the same. If I asked for chicken livers at the grocery, they would stare wide-eyed. No, comfort food is a place, a reminder of time. Bob Evans has taken mush off the menu but still serves it. I sense that it may be on the way out. Chicken livers are certainly not good for healthy eating and most chickens hate relinquishing a good liver. So perhaps those will disappear as well. 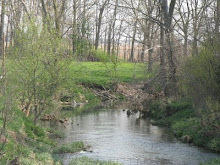 I am comforted that I could go to places that still remember and give me a glimpse back to a time of embracing comfort. Mush. It’s more than a way to get sled dogs to move.